The Request for Proposal (RFP) for the construction of the HUNDERTWASSER ART CENTRE with Wairau Māori Art Gallery has now closed and the review process is underway. The formal Request for Proposal closed on Friday, February 9th with all proposals received from local firms. Whangarei’s HAC project team are preparing to release a formal Request for Proposal (RFP) for the construction of the Hundertwasser Art Centre with Wairau Māori Art Gallery. Registration of Interest (ROI) documentation was lodged on nationwide tender platform GETS last Friday. The final project design includes considerable changes to both the foundations and the structure of the building, for the purposes of seismic strengthening. The finished art center will be substantially heavier than other buildings of similar size, due to the extensive exterior finishing and the forested living roof. The revised construction methodology requires substantial below-ground foundation work as well as the complete deconstruction of the existing NRC building. All materials suitable for recycling and repurposing will be salvaged from the building, removed from site and brought back to be incorporated during the finishing phase of the project. The design of the building’s unique internal spaces and external finishing remains unchanged from the original model, created in Vienna by the Hundertwasser Non Profit Foundation as the ultimate template for the finished art centre. The new designs and regulations will not require any additional budget above that which has already been raised, rather a change in approach, says HAC project co-chair Barry Trass. “By ensuring we not only meet but exceed current regulations, we are creating a lasting asset for our community and generations to come. It is of the utmost importance that we do this once and we do it right,” he says. The foundations of the building are complicated and critically important, and this part of the pre-construction phase has required a massive amount of time, expense and specialist engineer input (the original WDC solution pre-dated new earthquake-proofing regulations). We now have a final recommendation, awaiting peer review and Council sign-off. The Project inherited existing floor plans from the WDC, but we’ve made revisions and tweaks to ensure the back-of-house work areas are more practical and useable. No changes have been made to the galleries or other public spaces like the Education Centre and Theatre. Much more work has been done on the roof garden and we’re close to having a finalised planting plan; it’s an incredibly important part of the visitor experience and we need to get it right. 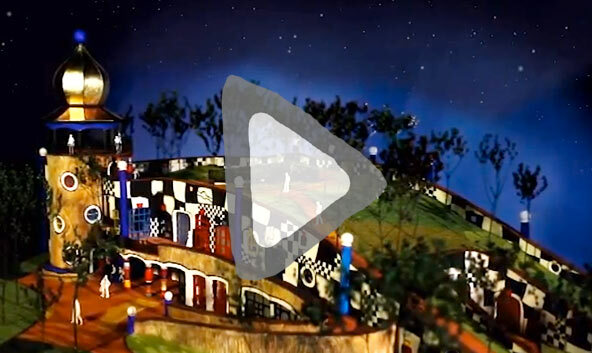 Translating the Hundertwasser roofgarden kaupapa for New Zealand conditions has been challenging, but we’re excited about how awesome it’s going to be. Trees are already being grown and the roof will be a veritable forest, even from opening day. We’ve been working with engineers, architects, designers and specialists on all these design elements, with the input and approval of the Hundertwasser Foundation in Vienna. Once the design phase is fully signed off, we’ll quickly move to procuring construction contractor/s, developing a construction contract and agreeing to a tendered build price. The Project has been working with an independent procurement specialist to develop a transparent tender process and we’ll bring you more information about that when we’re ready to release our Registration of Interest (ROI) documentation. We need to have all this work complete and consented before the end of the year, so we can start building in early 2018. The vast majority of our donations and pledges are not available until after we start building, but we badly need more unconditional funds to pay for engineers, architects etc. If you have already Pledged and you would consider giving your Pledge now – of if you would like to donate to the project immediately – please get in contact here. As always, we immensely appreciate your help. It’s been over a month since we reached our huge construction fundraising goal. We are finalizing the engineering design and once this is done we can instigate the building consent and tender processes. This whole process needs to monitored under council due diligence. We hope to be underway by the end of the year. The team is developing an exciting new campaign to keep you all involved and informed and excited, right up to the Art Centre opening in 2020. In the meantime, we still need your help. We have reached the estimated build cost but opening a facility of this calibre involves much more than just bricks and mortar. Our attention is now on the ‘operational and fit-out’ budget; things like lighting and gallery displays, developing an international marketing programme and hiring some key personnel who’ll need to be fully on board well before the doors open. So we invite you to continue to purchase art via our online Art Shop – all proceeds of art sales go directly to the project and it’s such a positive and creative way to support your Art entre. The HAC Building Stone print in particular is now the project’s founding visual document and even more valuable and collectible. At the moment, there is no better way than displaying this print in your lobby or home to show your customers, clients and friends your support for this pivotal project. Also hot off the press is our new Michael Smither limited edition screen print entitled Horseshoe Bay. It is priced at $320 so very affordable. As the dream gets closer to reality, being a donor gets even more exciting. Check out how to put your name on our Taonga, there are several levels and schemes to choose from. This is the most exciting and creative stage of our project and we intend to take our faithful supporters with us all the way to Grand Opening Day!